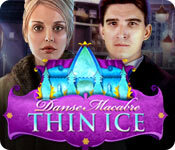 Danse Macabre: Thin Ice is rated 3.7 out of 5 by 11. Rated 5 out of 5 by CourageAngel from Crime on Ice We are called to keep a "crazy fan" away from the star performer, Ruth. When we are finally able to access area past the front gate, we soon have a homicide to investigate. Is someone threatening the star skater? Why? Who? Can you solve the case before they get away? It got a bit predictable on who the culprit could be at a certain point. It didn't take anything away from the game, but I like trying to solve the question of who did it. That's why I enjoy these types of games. I like that it allowed you to go over the info/evidence collected. 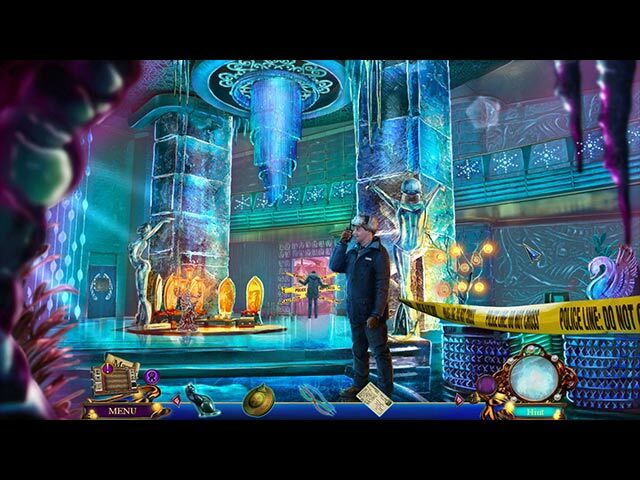 The puzzles aren't too difficult, and neither are the hidden object scenes. I like that they offer the "Match 3" as an option on the HOS. And hey, they had a mahjong puzzle! The video trailer for the game shows a scene that didn't happen in the (SE) game. Does it happen in the CE? I couldn't tell you... The end/confront the culprit scene was nice. I like how you get to present evidence of their guilt. And the one just stands there and lets it happen. "I'll just be standing over here quietly while you talk about me." Overall, I really did enjoy this game. If you're a mystery fan or just a fan of the series, I think you will enjoy this game. Rated 5 out of 5 by CyndiLouWho2 from Somewhat Predictable But Who Cares? I won't go into the story line because others have probably revealed too much info about the plot already. Anyway, this game reminded me somewhat of MCF Dire Grove. It has just the right amount of creepiness, horror and mystery all rolled into one. I couldn't stop playing it -- taking an entire afternoon to finish it. Graphics are superb, as were the voice overs. 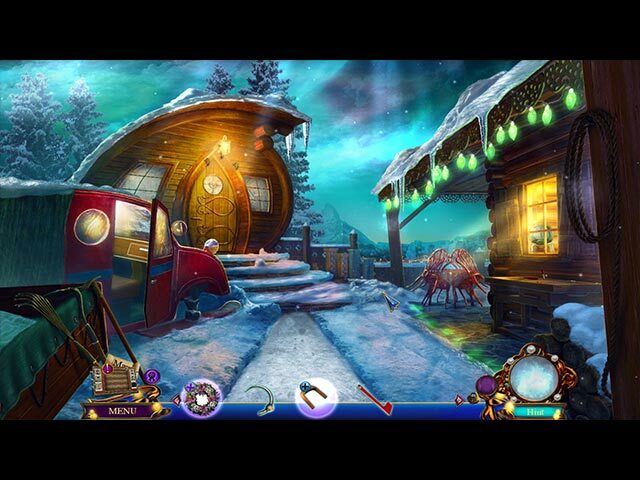 The hidden object scenes were interactive with not too many objects to locate. Puzzles were thought-provoking and didn't take too long to solve. I played on Custom mode, which I loved. There is a lock-able Inventory section. While some found Thin Ice to be a bit too gruesome, I thought it all fit together well. It's not a lengthy game and can definitely be played in one sitting. I recommend this one! Rated 5 out of 5 by Yanie1020 from Now This Is What I'm Talking About! 4 1/2 stars! Can't give it 5 because the puzzles weren't quite challenging enough. The storyline was ho-hum but I never really care about the story. I just like to play the game! One thing I really liked was the way they portrayed the characters. One of them had just gotten out of bed and he even had a bedhead! Really got a kick out of that. Music could have been better but I don't take away stars for music, just as I don't take them away for a lame story. Voiceovers were fantastic! Eipix is using some great actors in their games. I'm starting to recognize some of the male voices from all the Eipix games I've played. I think most players will love this one! Nice length, too! Rated 5 out of 5 by kateblue222 from To CE or not to CE, that is the question. I know it sounds kind of crazy, but I forgot how much fun I was having with this game. Life intervened, days passed, and I just played the next game down the road. Then, when I saw the SE was out, I couldn’t remember what I had done even though I already own the CE. But when I saw the first screen, I wondered how I had ever forgotten. I am excited to be returning to the snowy north. The art is clear and sharp and strong and colorful. I am quite happy to wander around and look at all the pretty pictures, one of my favorite things about these games. This one satisfied. I didn’t like the music, though. I turned it all the way down. Everything seems so over-orchestrated these days. The mini games (my favorite part) are good and the HOS are excellent. I am not necessarily a HOS fan, but these are interactive and very fun, more of a combination puzzle and HOS than a straight HOS. There’s a really cool transition between the first and second chapter, as I recall. I will let you find out about it on your own. I never looked at the strategy guide that is available in the CE. Seamless, understandable game play made it unneeded, a real plus. Here's an annoyance. I read text much faster than the narration speaks. I always like it when the game will let me click through the narration screens because I don’t need to sit there and hear it. This game would not allow me to skip through screens of narration, though. Instead, I could only skip the whole conversation. I don’t want to do that, either. So that was annoying, but it was the only thing that was annoying. I recommend this game, but I also think the CE has great features. I know that if I am reading game reviews after the SE comes out, one of the things I need to know is, should I buy the CE or the SE. Here, I think the CE is a good deal. Not only does it allow you to play the mini puzzles and the HOS again, it allows you to play the Match 3 games that substitute for the HOS. It has a bonus chapter, a "making of” feature, and the usual music and art. There are also achievements and collectables, but I do not really notice them much, so I can’t tell you if they are any good. Still, it makes for a more value in a game. Much of the game is not unlocked for me since I am only halfway through. But I think it is going to be worth the CE price because I am having so much fun I want to play the bonus chapter and I want to play some of the puzzles again. To sum up. I say buy the CE, but certainly the SE would be fun, too. Rated 4 out of 5 by denniann2 from an ice skating show gone bad you have been summoned to help find out why the biggest fan of ruth,a man who was there to warn her of how much danger she was in, the star of the ice skating show has been killed. it is the last dress rehearsal and then ruth is killed as well. there is a custom level and an interactive map that you have to use arrows, sometimes, to see where you need to go. it is a big area of playing. the HO scenes are silhouette, sometimes, then riddles. they are not hard. Rated 4 out of 5 by PATinPNS from The Ice Thickens This is posted after playing the entire game. This was a pretty good game. I enjoyed most all of it. Didn't really know what to expect, but Eipix hadn't let me down yet, so I went ahead and got it after playing the demo. Perhaps the only disappointment I had was in the graphics. They were a bit over drawn and jumpy. They weren't smooth and almost lifelike as in other games from this developer. The sound was excellent. Voice overs were well done, effects perfect and the music went along with the action in the scene. The level of challenge was fine for my tastes. I play these games to relax and pass an overly hot Florida afternoon and this game did just that. There is a lot of variation in the hidden object scenes. Everything from shadow, to association, to lists and others as well. I have to admit some were pretty simple while others were somewhat more challenging. The same was true of the mini games. If you are one who likes the challenges of hard, mind bending minis, you probably won't like this one. There is an interactive map which is almost a must for me now. It shows where there are things to do and objectives to achieve and of course transports you anywhere. The evidence board they provide, well, I just haven't found the value for it yet other than reading something and going back to see just who the person is. Other than that, I didn't use it. It just repeats what you have just seen and no reference for things in the future. I won't bore you by going over the story line with you. It was consistent and held my attention throughout the game. I didn't even get lost which normally occurs with me. While I have played better games from Eipix, this one is passable and something you really should check out. Play the demo and see if it isn't something you might enjoy also. Rated 4 out of 5 by pennmom36 from Very Thin Ice Ruth Fisher is a talented young woman, an up and coming figure skater and the star of the show. There's just one small problem, her life is being threatened by an overzealous fan with not so good intentions! Ruth's manager, Christopher Chardy, has requested your services to provide security and keep her safe, but safe from whom? Perhaps her partner Walter is a bit disgruntled, after all Ruth did publicly humiliate him during a lovers spat, perhaps someone from the show who is clamoring for her star status, maybe even her manager Christopher Chardy? Once again you have an electronic but slightly archaic Evidence Board that keeps track of information on each suspect you meet and any important information you find during your investigation. Some of the inventory items have plus signs indicating some type of interaction is necessary before that item can be used such as combining that item with another inventory item. The Collector's Edition has 42 Snow Globes to Collect, and 14 Achievements to earn, some of which have 3 stars per achievement. My biggest complaint with this game, is that the graphics are all that great, I don't recall the other Danse Macabre games having this poor of graphics. The Hidden Object Scenes are different every time, some are progressive, interactive silhouettes where you find an item and use the item in the scene to uncover the next item, there are combination silhouettes where two silhouettes combined would make a particular item, even finding 6 shovels and 6 pick axes to receive the correct tool to uncover a list find! In the Collector's Edition, 14 of the HOP's have a Morphing Object within them, and you can opt for an endless game of Match 3. The Mini Games are in abundance, there are a lot of quick matching games but also longer more complex puzzles. My two favorite was rotating circuit boards of different shapes and placing the correctly into a patterned grid, and driving the snowmobile and "steering" it safely between rocks. The Collector's Edition has 14 Achievements, 42 Collectible Snowglobes, 14 Morphing Objects, replayable Match 3, replayable Puzzles and HOP's, Souvenirs, Movies, Music, Pictures, Behind the Scenes, a built in Strategy Guide and a Bonus Chapter, enjoy! Rated 3 out of 5 by mrm2006 from Wake me up when it's over! Based on the beta, CE and SE demos An ice scuplture, no matter how stunningly beautiful and admired, can also be ...... destroyed. The star of the ice rink show is in danger. She is being stalked but, realistically, what can you do??? The graphics are .... ok. I HAVE seen other games where the graphics were so realistic ..... it could almost be "real life". Yes .... THAT lifelike. The music was ok, not annoying. I didn't have to turn it down. Sound fx were very well-done too. The voice overs were, for the most part, very believable. There was ONE character that really could have been tweaked a bit to sound appropriately realistic and not so .... squeaky (?). There are 4 modes of difficulty: Casual, Challenging, Expert and Custom. The tutorial offered you choices of NO tutorial, Special Features only or Full tutorial. The HOGs (hidden object games) varied from VERY interactive lists to silhouettes and word games and more . Never anything dull and boring .... because then I wouldn't have played them and opted for the Alternate Match 3 game. lol A lot of the M/Gs I came across required patience (yes, yes, we all know .... I have none - big grin ) and took a bit of time to complete. Besides a map (shows where you are and where available objectives are - I like that it shows MORE than 1 available objective area at a time), there is an Evidence Board. The Board holds pictures of the key characters in the game, with a mini-bio and "Objectives" and "Messages" tabs. The "Messages" were NOT really messages but pieces of paper, notes, etc. you find during the game play. Also, the Evidence Board was almost on top of the Map and clicking the wrong one was a problem throughout the game play. I think the story line was .... ok ..... not brilliant. This modern "whodunnit" sends obvious signals that the "obvious" does NOT lead you to the obvious culprit. HAH! lol I would recommend it to all levels of expertise. Unfortunately, this is NOT a purchase for me. I got bored very easily. The 'ultra-modern' scenes hurt my eyes a bit - ouch! I never felt 'connected' to the game play. Nor did I get my personal 'wow' factor at the end of the demo. 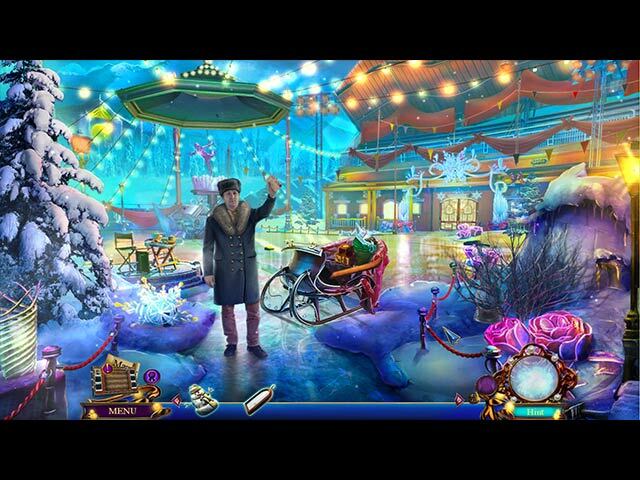 Still and all, let's drop into this winter wonderland and see if you can find ...... whodunnit! Enjoy! Rated 3 out of 5 by AsiaMinor from ho hum I was bored throughout the game. The mini puzzles were stupidly easy and the graphics were colorful but I don't know why the objects were drawn so dramatic. eg; a bedroom with a snow bank in it....? good for beginners. Rated 2 out of 5 by roaming from Star skater falls flat. The graphics, although colorful, are plain and drawn with no imagination. The HOS are too easy and not interesting. The characters are one-dimensional. The adventure is limp, and the story is exactly the same as previous games in this series simply plopped down in a different setting. In a word? Boring.